Aztec embroidery, fade-effect tan straps and brass buckles combine to create the man-made Leeds B sandal. 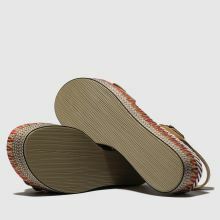 The strappy Blowfish profile allows an adjustable fit and sits on a 5.5cm patterned platform to bring a bit of colour. Just add sun.